The musicians will compete at the annual competition at Messiah College in Pennsylvania. 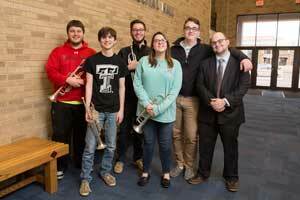 Six Texas Tech University trumpeters are headed to a national contest to blow away the competition. An ensemble of five students from the School of Music is going to Messiah College March 19-21 for the National Trumpet Competition. Junior Andrew Pacheco, junior Benjamin Post, freshman Pierce Ellison, junior Joshua Dolney and sophomore Elisabeth Wiseman will travel to Messiah, Pennsylvania, for the competition. A soloist, senior Lucas Meade, also qualified. The group submitted a video performance in December, which was rated by at least three judges. Thirty ensembles in the 4-6 member category will compete in the semifinals on March 19, then judges will rank the top ensembles, who will perform again in the finals on March 21. A Texas Tech ensemble auditioned last year but didn't qualify, so this year's results were even more exciting. “I was clicking the refresh button every five seconds waiting for results,” Dolney said. Once he saw they were in, a group text followed. “We all posted on Facebook too,” Ellison said. 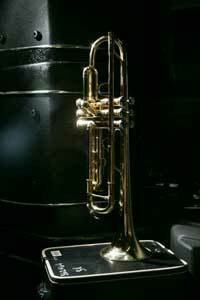 Stetson got the text while performing with an old professor – the same professor who helped him the first time Stetson was invited to the National Trumpet Competition as a student. “It was a really special moment for a close mentor to see the excitement I had as a student evolve to excitement for my own students as a teacher,” he said. Other Big 12 schools that qualified are Baylor and Oklahoma State; additional Texas schools include Texas A&M-Kingsville, Southern Methodist University, Texas State and the University of Texas-Pan American. Getting into the competition was the result of many hours of group practice from mid-November to mid-December, plus 14 hours of recording to produce their 8-minute audition recording. That doesn't include the individual hours each trumpeter put in and time spent in one-on-one lessons with trumpet professors Stetson and Will Strieder. The work isn't over now that Texas Tech is in the competition: the six musicians need to raise at least $5,000 to pay for the trip. Stetson said he planned to apply for a grant from Texas Tech's Center for Active Learning and Undergraduate Engagement. They will also look to the School of Music and student organizations for any financial help, but Stetson said they won't shy away from traditional fundraisers. “The students set up bake sales better than anybody,” he said. In addition to the competition, which includes four categories for soloists, small and large group ensembles and jazz performances, a number of musical groups will perform, including the Army Herald Trumpets and Marine Band and the Airmen of Note. Musicians like Scott Wendholt and Rick Baptist will teach master classes, and exhibitors will attend to show off the latest trends in instruments, recording and music.